A few weeks ago, I had the creamiest baked potato soup for lunch. I went home the next day and re-created it, and I think my own version was even creamier. If that is even possible! Yes, I realize this makes multiple posts this week that include bacon. I just can’t help it. Bacon is my soulmate. It never leaves my side. It doesn’t judge me. You know what though? I think it’s time bacon and I took the next step in our relationship. I’m going to start doing squats with bacon and bacon bicep curls. It’s very necessary. So if you don’t like bacon or don’t eat it, it definitely isn’t necessary in this soup. But I mean… it’s the best? I added the bacon once the soup was finished… half of the bacon went into the soup, the other half was saved for garnish. The starchy potatoes gave the soup such a thick, smooth consistency. It was addicting. Such major comfort food that I couldn’t even stand it. This is a soup that my mom has always loved and it looks like I’m following suit. Plus, there is also cheese. Cheese in the form of smoked cheddar. Oh my gosh – the best cheese to ever exist? I don’t make soup very often, because, well… I have no patience. While soup is simmering away, I usually consume a few bananas, some sandwiches, chocolate chips by the spoon-full, and, of course, wine, since it most often lands in my soups. No wine went into this soup, but I had a few sips for good measure and I can’t even tell you how great of an idea that was. Finally, the best part of this soup was that while it was super-duper creamy, there were some soft chunks of potato in it, too. I used yukon gold potatoes and left the skins on – such a tasty treat! Ridiculously satisfying and pretty darn simple too. Be sure to bake your potatoes ahead of time – you can even use leftover baked potatoes! Heat a large pot on medium-low heat. Once hot, add the butter and let it melt. Add the flour and whisk into a roux, until the mixture is fragrant and slightly golden. Slowly pour in the heavy cream, milk and stock continuously stirring until thickened. Add in the potatoes. Reduce the heat to low and gradually stir in the cheese, making sure it doesn’t stick to the bottom. Simmer for about 15 minutes, stirring often. If the soup is too thick, add a bit more chicken stock. Stir in 2 slices of crumbled bacon and half of the green onions. Season with salt and pepper if needed. 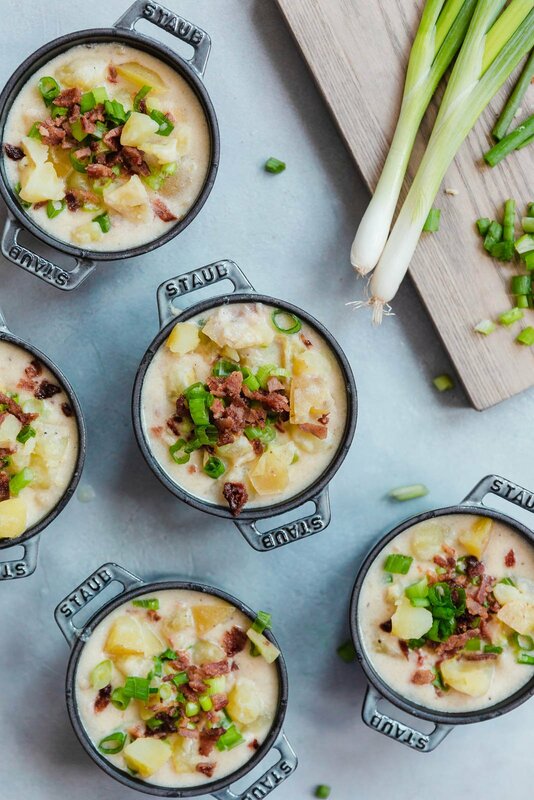 Serve and garnish with remaining bacon and green onions. I went back for 2nd’s, 3rd’s and 4th’s – the soup was that incredible. I actually ate it all before Mr. How Sweet got any of it Oops. Bite Size Chocolate Chip Cookie Ice Cream Sandwiches. see i was wondering about the milk because i refuse to buy any this other than whole milk. so it turns out right? Yes it came out perfect! The same full, fluffy chowder texture too. I live in Southern Japan and the milk here is about 3% (and I used 1 c whole whipping cream too), but that didn’t affect the soup at all I think. Not the healthiest soup haha, but oh wells it was great and satisfying! I found this on Pinterest a while back and knew I had to pin it. I love your blog anyway, and I’ve never made anything I didn’t like from your recipes. Anyway, I made this tonight. It was perfect. Thanks for sharing such great recipes! The barbell curl specifically targets the biceps brachii which is located on the front part of the arm between the shoulder and the elbow. This muscle’s primary function is elbow flexion and forearm supination. The biceps also has two heads known as the long head and the short head. ;;,.